Now it was my turn. The offending case was rescanned, fingers were pointed at the screen, and heads nodded all round. With neither eye contact nor facial expression the be-gloved, middle-aged, official asked me if I was carrying a knife. I denied such and the search began. First, innocent wodges of paper were removed and placed on the table. Attention then fell on my toilet bag, my medicines and a razor. After a cursory inspection they too joined the papers, and the half empty case was scanned again. Yes, the offending item was still there and the officer walked smugly back towards me carrying the case. The search restarted. Then two things happened as though simultaneously. For my part, I suddenly remembered that I did indeed have very small penknife (Swiss Army) tucked away in my pencil case. For her part the official, who was now delving deeper into my luggage, discovered under a shirt, a stethoscope and a bible. Just as I was about to apologise for my oversight, she lightly touched her recent discoveries, looked up at me with an expression of beatitude and said in a hushed voice, “I think we need search no further” and offered to help me repack. The penknife and I were free to go. 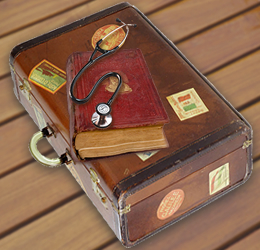 Although retired, I often carry a stethoscope ‘just in case’, so while its appearance in my case was odd, it was not surprising. The bible was a very different matter. As a devout atheist it would be the last thing with which I would normally want to associate. On this trip, however, my wife (also an atheist) had asked if I could carry two books for her as they were heavy. One was a novel, the other an English bible she had bought and was bringing back to France at the request of a friend. Notwithstanding the existence or otherwise of a God, believers are moved to work in the most interesting of ways.